I’ve mentioned that UltraIronHubs is dealing with plantar fasciitis right now, but I haven’t really gone into detail about how bad it is. It’s bad. He hasn’t run for over three months now and he is such a crabby apple that he is spoiling the whole darn bunch. The awful thing about PF is that there’s no end in sight. With a stress fracture, you slap on a boot and two months later you’re back on the streets. But with PF, healing could be quick or it could be really, really, really slow. Right now it’s looking like the second one. Boo! UIH has been training for a half-iron aquabike event to keep himself from going insane, but neither swimming nor biking are his strongest events, so his excitement level for this race is mediocre at best. He’s been religious about doing PT exercises every day and sleeping in the Strassburg sock every night. He stretches, he ices, and he strengthens, but there’s been very little relief from his pain. He cautiously started very, very short runs with a new-and-improved midfoot strike, but that has been almost more aggravating because it’s running, but it’s not enough – so close and yet so far away, you know? At this point, his foul mood seemed permanent. He’s smiling! SMILING! I haven’t seen that for months! UIH has taken the ElliptiGO out for a spin several times now and, like everything he does, he made it look so easy that I figured I should give it a try. Heading out for my maiden voyage. Wish me luck! It’s a whole ‘nuther sport altogether. You might hop on the ElliptiGO because you’re an injured runner looking for something that feels like running. Or you might be an avid cyclist and think you’ll enjoy being on a different set of wheels. Or you might even be a gym rat who loves the elliptical machine and you’re thinking about taking that love out to the bike lanes. Lemme tell ya, this ride is like nothing you’ve ever done before! I spent a good portion of my ride reminding myself, “This is not a bike.” But the thought also went through my mind that this is not an elliptical machine, this is not running and this is not a scooter (I know that last one sounds funny, but the position of your arms and your body are a lot like riding your kid’s Razor scooter!) 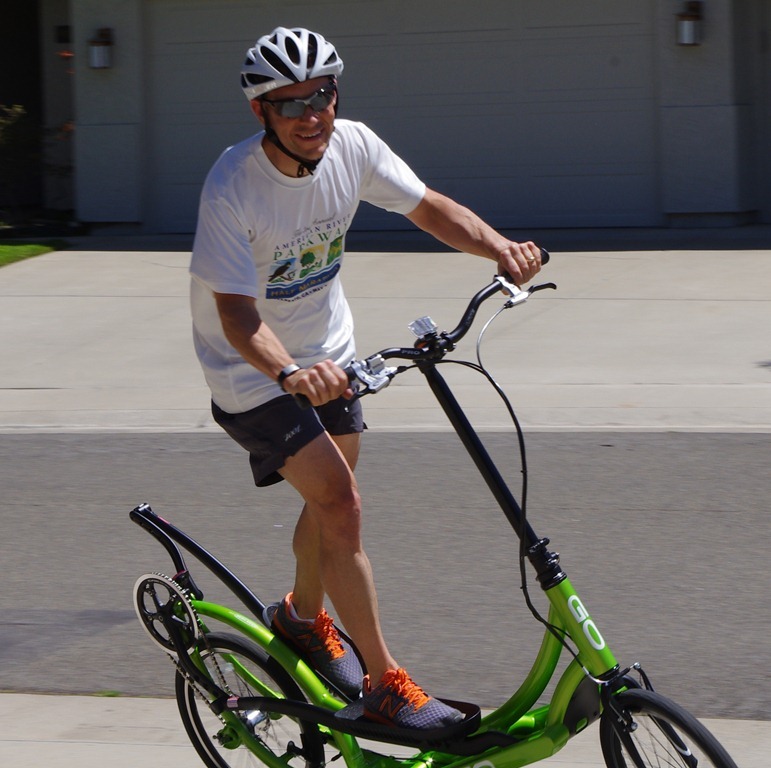 The ElliptiGO has elements of all of these exercises, but it is in a category all by itself. It is a serious workout! Watching UIH zip around our cul-de-sac like a speedy little butterfly had me thinking that the ElliptiGO was going to be a fun little cruising-type workout. Umm, no. I went just three miles this morning at a speed roughly halfway between my biking and running averages and my heart was hammering out of my chest. The ElliptiGO used every single muscle in my body! My core was engaged throughout the ride in a way it never is on my bike and I was surprised at how much upper body strength it required, even though your hands are stationary on the handles. And my glutes! OMG. It’s a mental workout, too. Let me clarify first that I am a girl with coordination issues. The reason running is my sport is because running plus kicking/throwing/catching a ball is waaaaaay too much for me to do all at once. In short, I’m a doofus and my learning curve is always pretty steep, so I suspect that with time and practice many of the things I found challenging about riding the ElliptiGO will become second nature. Specifically, getting on and off was more difficult than I was expecting. I almost fell off before I even got going the first time because I couldn’t get any forward momentum and yet I was higher off the ground than I thought, so my foot didn’t know where to catch me. Silly foot. If you’ve been to the ElliptiGO website, you’ve noticed the big price tag. It’s expensive, there’s no two ways about it. Thankfully, we’re triathletes around here, so dropping thousands of dollars on something with wheels isn’t a shock. Ha! Seriously, though, it’s an investment and one that I think is worth making. We got the 3-speed ElliptiGO because we live on flat land and I think it’ll be plenty usable around here. As for quality and construction, the ElliptiGO is again in a category by itself. It’s heavier and sturdier than a road bike, but lighter and more durable-feeling than your standard home gym elliptical machine. The tires are thicker than a bike’s and for their small size (20 inches), do a decent amount of shock-absorption. The brakes are responsive and the platforms for your feet are both thick enough to feel substantial but light enough to move quickly. And have I mentioned yet that it’s just plain FUN? In case you were wondering, I did not get paid for this review and I purchased the ElliptiGO myself. Of course, if the ElliptiGO company wanted me to try out their other products (there’s an 8-speed and 11-speed version), I would absolutely make room for his-n-hers versions in my garage! OH my goodness. I live near the elliptigo capital! Eugene is filled with them. Lots of runners there- and quite a few people using them for cross training. I think they would be fun! Hope UIH gets better soon. I haven’t seen these but anything to get out there sounds good. Good luck with the PF to your hubby. It is no fun at all. I hadn’t seen these, either. Very cool that you guys were able to pick up one for UIH. Hmmm I am intrigued, looks like fun! Bought an 11R about a month ago and I must say everything you’ve said is spot on. Rides that might normally take me 30 minutes on my bike take almost twice as long on the Elliptigo. Quite frankly it’s a humbling experience. On the plus side it’s also a calorie burning barnstormer. I’ve already shed almost ten pounds and am now having to increase my daily caloric intake because of the efficacy this machine (I should add that I do a lot of hill climbing). Yes it was a big purchase but I can happily say I’m smaller for it! So how has the Elliptigo worked out long term? Was it effective for providing serious training while recovering from plantar pain? Any other issues with it? My wife has been dealing with degenerative knee issues and had to stop running and reduce cycling. We were looking for some alternative training methods and came across the ElliptiGO. After test riding, we bought one because of the smooth motion and low impact. She had it now for over 4 month and had been able to build up endurance and leg strength and reducing knee issues. Thanks to that, she is now also fully back on the regular road bike, alternating between the bikes. 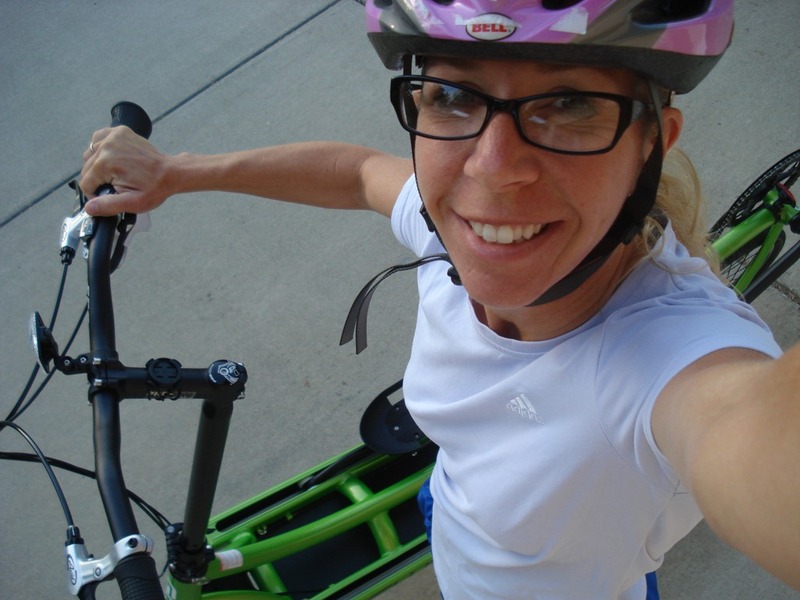 I started riding the ElliptiGO also and absolutely love it. I have my own knee issues and by cross training with the ElliptiGO, I can maintain or increase my performance without straining the knee more. If my knees complain a little, I just borrow my wife’s ElliptiGO. We have now 10 bikes between us (Road’s, MTB’s, TT’s) and the ElliptiGO is becoming a favorite. It is the most fun to ride. I will soon have to sell some of the other bikes and get my own. The price is on the higher end, but it is very high quality. It is very hard to find any used ones. Seems like once somebody owns one, they keep it. It is nice that one size fits all, so I can use my wife’s for now. The handlebar height is adjustable, but I ride the same height as her. The height adjustment does not seem so critical since you are standing. It is very easy to ride and very stable, but it takes some practice to feel comfortable to take your hand of the handlebars to take a drink for example. The best is really the great low impact workout and fun to ride it provides. Even if I would not have to nurse knee issues, I would keep riding it. It definitely has improved our active lifestyle enjoyment. We are monitoring our workouts on Strava and it will be interesting to see the progression.